The collection is housed in the Clunes Museum a C. 1860 shop in the main street of Clunes, Victoria's first gold town,originally the warehouse of Nicol & Wallace who established the business in 1859. The major strengths of the collection of 4000 items are photographs and items pertaining to gold mining, agriculture, industry, factories and commerce, education, local government, religion, WW1 & WW2, and domestic life, together with local community archival records. 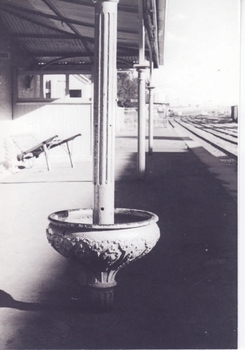 The collection is owned by the Hepburn Shire Council and managed by volunteers. A recent Regional Development grant has enabled the addition of library, visitor information centre, community meeting room Hepburn Shire Customer Service and a large exhibition gallery. The Museum is now part of the Clunes Community Interpretive Centre which has almost reached completion which will open later in the year. The collection is at present in storage. 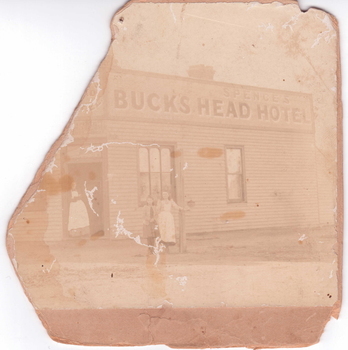 The collection documents the local history of the Clunes township and district. Have u tried the mechanics institute in ballarat or the gold museum? CERTIFICATE OF SPECIAL LAND PURCHASE. SPECIAL LAND PURCHASE CERTIFICATE FOR LAND PURCHASED BY JAMES GRIFFIS OF CLUNES, DATED 4TH APRIL 1862. BOOK - "YEARS OF ADVENTURE"
BLACK & WHITE ORIGINAL OF W. GILLESPIE. 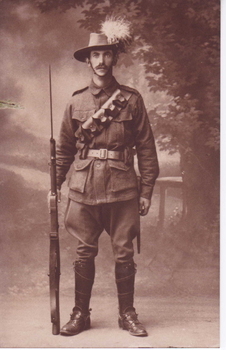 THE PHOTO DEPICTS THE UNIFORM OF A LIGHT HORSEMAN IN THE 1914/18 GREAT WAR. FEATURED ARE THE RIFLE AND BAYONET, SHOULDER BANDOLIER, LEATHER LEGGINGS AND PLUMED HAT ALSO BAYONET SCABBARD AND LEATHER BELT. 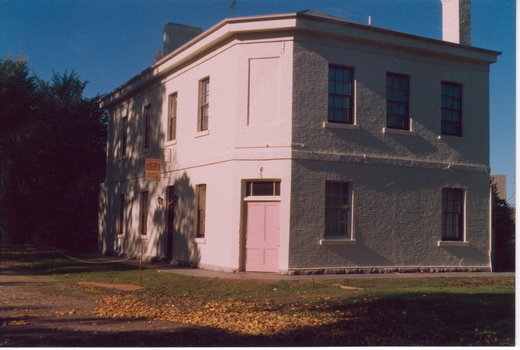 "KEEBLES"CLUNES BUILDING ON THE CORNER OF BAILEY AND FRASER STREET.THE BUILDING WAS ORIGINALLY THE TELEGRAPH HOTEL. WOODEN FRAME, GLASS COVERED. PEN AND INK DRAWING OF LADY WITH BASKET. TWO SWANS ON WATER. SMALL HOUSE AND MANY TREES IN BACKGROUND. SHRUBS IN FOREGROUND. WOODEN BRIDGE. THIS LLUSTRATION WAS GIVEN TO MRS. HOLLAND ON THE THIS DRAWING WAS GIVEN TO MRS. HOLLAND ON THE OCCASION OF HER WEDDING, BY THE ARTIST MRS. JANET McDONALD WHO MARRIED IN WESTERN AUSTRALIA AND LIVED THERE FOR 50 YEARS BEFORE RETURNING TO CLUNES TO LIVE IN SERVICE STREET, NEXT DOOR TO RIDLEY'S. 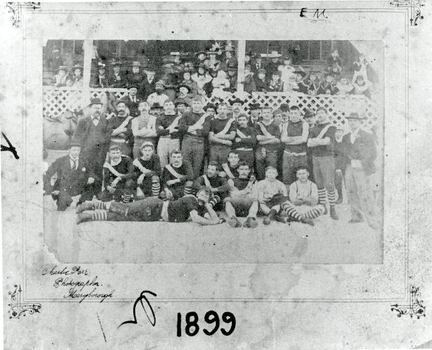 On Front: Hand written in black ink E.M. - Hand written in black ink Charlie Farr, Photographer, Maryborough On Reverse: Hand written in black "Premiers Clunes United Football Club, Premiers 1899", hand written in blue biro MADDEN FAMILY, hand written in blue biro "Eric Butler 1123 Eyre Street Ballarat. COPY OF JOHN LONGSTAFF'S "BREAKING THE NEWS" OIL ON CANVAS. ENCLOSED IN VARNISHED WOODEN FRAME. ORIGINAL PAINTING HANGING IN WESTERN AUSTRALIAN ART GALLERY - PICTURE DEPICTS MINING TRAGEDIES IN THE LAST CENTURY. 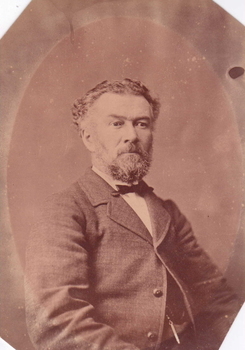 JOHN LONGSTAFF LIVED IN CLUNES IN HIS EARLY DAYS. "BREAKING THE NEWS" OIL ON CANVAS. 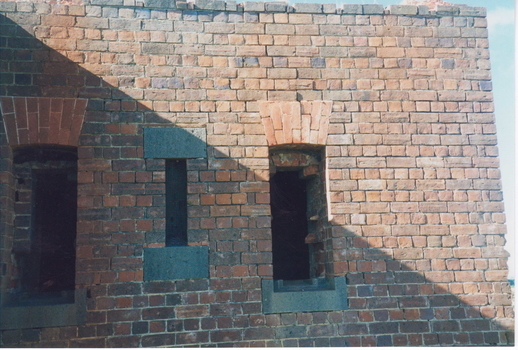 COLLECTION OF THE ART GALLERY OF WESTERN AUSTRALIA.COPYRIGHT RESERVED. 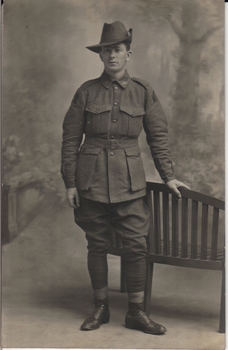 COPY OF PHOTOGRAPH OF BOOKHOLT, H. WEARING A W.W.1 AUSTRALIAN UNIFORM. 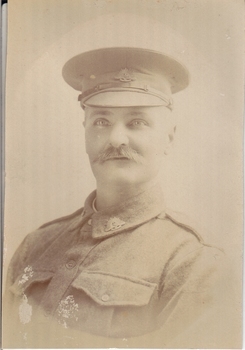 COPY OF PHOTOGRAPH OF DUNSTAN,ELDRED WEARING A W.W.1 AUSTRALIAN UNIFORM. On sides of bottle "Schiedam Aromatic Schnapps" "Udolpho Wolfe's"
A COLLECTION OF ARTICLES ABOUT COOKERY WRITTEN BY "RITA", PRINTED IN BOOK FORM BY THE "HERALD & WEEKLY TIMES"
"RITA" THE AUTHOR WAS SOCIAL EDITRESS OF THE MELBOURNE "HERALD & WEEKLY TIMES"
SMALL BOOKLET. HOW TO DECORATE HALLS - BOOTHS AND AUTOMOBILES. RELATES TO BYGONE ERA AND DECORATION OF HALLS BOOTHS AND AUTOMOBILES. CONTAINER - FLOORFAST FOR BALLROOM FLOORS. CONTENTS TO MAKE BALLROOM FLOORS FAST. FLOORFAST USED ON CLUNES TOWN HALL FLOOR. CONTENTS SPREAD ON DANCE FLOOR TO MAKE FLOOR SMOOTH AND FAST. FIRST SWEEP IT WELL THEN SPRINKLE IT WITH FLOORFAST TOGETHER WITH A QUANTITY OF SAW DUST. AFTER FLOORFAST HAS BEEN WORKED IN, EITHER BY POLISHING SLAB OR DANCERS FEET, THE SAW DUST MAY BE SWEPT OFF. GIVES SPLENDID RESULTS. SPECIALLY PREPARED BY J. KITCHEN & SONS PTY. LTD. ORIGINAL PHOTOGRAPH OF BUTTER FACTORY & BRIDGE OVER CREEK. 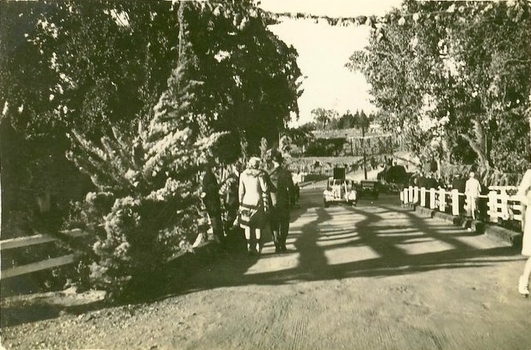 BRIDGE OVER CREEK, PHOTOGRAPH TAKEN FACING TOWARDS THE PARK. 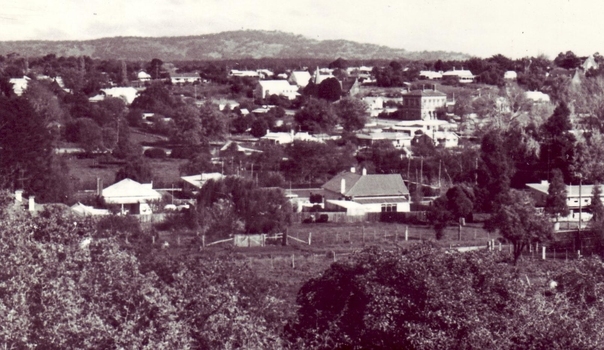 PHOTOGRAPH OF CLUNES TOWNSHIP TAKEN FROM THE SCENIC ROAD LOOKING TOWARDS MT-BECKWORTH.